Basket Arrangements by Sarah Coxon Floral Design. Order Online. 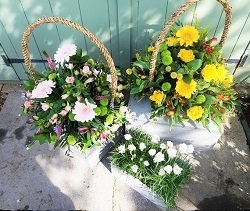 At Sarah Coxon Floral Design we are delighted to offer a selection of beautiful basket arrangements, which are suitable for the very young to those who are young at heart! Like the flower arrangements, the mixed selection of flowers and foliage are expertly arranged in water retaining foam (oasis), but are secured in an attractive basket. We have a selection of baskets either with or without a handle. Each basket is tested to ensure water cannot leak through. Therefore water can be held in the basket, which helps the flowers to keep fresher for longer. Afterwards the basket can be reused by the recipient either for more flowers or as a useful container to keep allsorts of things in. Handled basket arrangements look fantastic with a helium balloon attached to the handle. The basket arrangements are a suitable gift for new births to symapthy flowers and every occasion in between, and are totally already arranged so all the recipient needs to do is to add water every now and again.